Deadpool 2 is one of my most anticipated movies of the year. I was surprised by just how much I loved the first one. I was expecting it to be good, but not nearly as good as it turned out to be. It was a refreshing movie, one that opened up new possibilities not just for the X-Men franchise, but for the comic book genre as a whole. So going into the sequel, I've been fascinated to see what we would get. Tim Miller is not returning for this installment, but John Wick and Atomic Blonde director David Leitch is stepping in instead. I've been a little bit concerned that Leitch would only be focusing on the action, and not the comedy beats as well. However, the first trailer we got had a good amount of comedy in it, paired with the action, which somewhat reassured me. You can watch that first trailer here. With the Super Bowl a couple of days ago, we thought it would be a good time to get a TV spot, though it never came. Instead, a full trailer for Deadpool 2 dropped this morning, with the film opening in theaters on May 18th. I really liked the last trailer, but this one is even better! I loved the beginning with Cable (Josh Brolin). When the first still pictures of Cable dropped online, I didn't like them. It didn't work for me. However, seeing him in action and hearing Brolin speak, I love it. It's perfect. Of course, then we get the funniest line of the trailer, when Deadpool (Ryan Reynolds) is commenting on Cable's arm's visual effects not being done: "It's not like we're trying to remove a mustache!" That was a perfect Justice League dig, and I loved it! Something the Deadpool 2 marketing has done so far is mix sequences shot specifically for the trailer and not in the movie, with actual footage from the film. I really like this approach, because it keeps them from showing us too much footage. 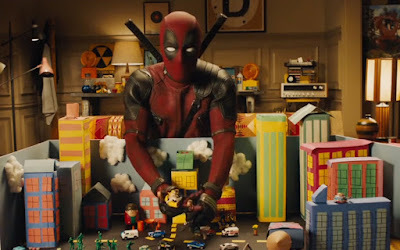 So after Deadpool plays with his action figures, we get a whole bunch of insane action shots, and here's where Leitch's action expertise comes into play. Deadpool 2 will certainly have better action than the first one, that we can immediately tell. But whether the movie as a whole will be better, that remains to be seen. But this trailer is definitely a step in the right direction. What do you think? Did you like the first trailer for Deadpool 2? Are you planning on seeing the film? Leave your thoughts in the comments section below.